Finally, at long last, it is fall. Put a little spice in your morning this week with a nice, warm breakfast you can make the night before. 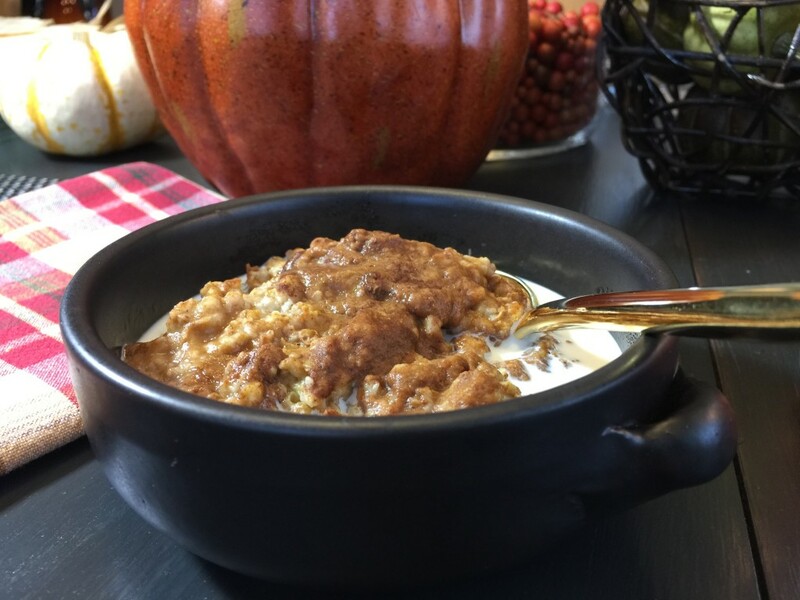 Overnight Slow-Cooker Pumpkin Spice Oatmeal is perfect for busy fall mornings. The prep is minimal and the ingredient list is small. It is just what you need for soccer mornings, school days, or just about any time you need a nice, warm breakfast but are too rushed to cook. Put all the ingredients in your slow cooker, turn it on before you go to bed, and wake up to the heavenly smell of a warm breakfast. I have made this recipe more times than you’ve heard the weatherman say, “Rains have returned to the Pacific Northwest.” Sometimes I will add in some chopped raw apple with the pumpkin. I have also left the pumpkin out entirely and used just the apple with the spices. You can omit the fat free half and half, or substitute your milk of choice. I use coconut milk, but only about 1/2 cup. Before you turn in, put out small bowls of optional add-ins — chopped nuts, brown sugar, raisins or dried fruit, dark chocolate chips, and some maple syrup and honey, ready to go for the morning, so that everyone can get their own. Leftover oatmeal can be frozen in ready to serve portions that you can reheat, microwaving with a little water. An ice-cream scoop sprayed with non-stick spray forms uniform portions you can freeze on a wax-paper lined tray. Once frozen, transfer these to a zip-top bag and store in your freezer. So grab your sweater, or your raincoat, let those leaves fall where they may, and let’s get this fall thing started. Spray slow cooker with cooking spray. Add all ingredients and lightly stir. Set slow cooker to low and cook, covered, for 8 hours — plus or minus. Refrigerate, or portion-freeze any leftovers.